Can You Monitor Commercial Security Alarms on the Same System as ULC Fire Alarm Monitoring? Most businesses in this day and age have security alarm systems installed to provided security, safety and detection for their employees and property. These systems have often been installed for years and years and have worked well during the years they’ve been installed. Many of these businesses often have fire alarm systems or fire sprinkler systems that they need monitored, and more recently require fire alarm monitoring certification to meet ULC S561. Often, the old security system was being used to monitor the fire alarm or fire sprinkler system, and is not able to monitor the systems to the ULC-S561 standard. 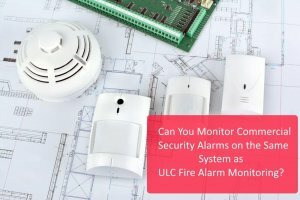 So the question for a business owner becomes can you even monitor a fire alarm system to ULC standards on the same system as a commercial intrusion system, and how do I go about getting a ULC certification for this fire monitoring set-up? The answer to this question is YES! You can monitor a fire alarm system or fire sprinkler system to ULC standards, however there are certain conditions that need to be met. We’ll cover each of these topics below. In order to properly monitor a fire alarm system to ULC-S561 in combination with a security alarm system I your business you must ensure that the equipment is ULC listed for the monitoring of fire alarm systems. This means that the equipment has been tested and certified for the monitoring of fire systems in Canada. Often, standalone security alarm systems are not listed for fire alarm monitoring, and need to be changed in order to satisfy this condition. Sometimes, this simply means changing the cabinet that the main control board is installed in to meet this requirement. Other times, the system may need to be changed entirely. Speak to your security or fire alarm monitoring company about what equipment you have installed, and what listings it may have. Once you have the proper equipment installed, you must ensure that the actual installation of the equipment meets the ULC-S561 standard. We have gone over what’s required in a ULC installation in more detail in this blog post, however you will need to make sure that wiring to the fire alarm panel is mechanically protected, that the monitoring transmitter has its own dedicated power and that all communications meet ULC-S561, whether they be active or passive. Often, the fire monitoring panel will need its own keypad at the monitoring panel to meet ULC-S561, above and beyond the keypads used to arm and disarm the commercial intrusion portion of the system. Once the above two conditions are met, the equipment must be programmed appropriately. Each manufacturer may have different requirements for how this is done. For example DSC security equipment requires fire alarm monitoring to have its own partition on the system, which is usually partition 1. Other manufacturers, such as Honeywell or DMP may have different requirements. Should I Combine my Commercial Security System and Commercial Monitoring System? So now that you know you can combine your security and fire alarm monitoring systems into one, should you? That question is harder to answer, and often comes down to cost. Sometimes, merging the two systems into one is logistically difficult, and this can be for a couple of reasons. An older security system may require extensive upgrades in order to meet the first condition we cited above. Or, an existing system may need many new wires runs, or lengthy wire runs in order to comply with a second. In both of these cases, the cost of a new, separate system may be significantly less than the cost to upgrade the existing system. On the flip side, if combining systems isn’t logistically difficult, combining systems into one can have some cost savings. Often you can obtain a “bundled” security and monitoring price for your monitoring for this sort of service, and you can consolidate communications costs onto one system. If you’re installing a new business security system from scratch, combining systems might be the way to go. To see what’s best for you, speak with your security provider to determine what needs to be done to combine your fire alarm and security alarm monitoring systems. As always, ensure you’re asking for a ULC certificate to prove that the system meets the ULC-S561 standard as this is the only proof your system meets the standard and meets the three conditions laid out above.